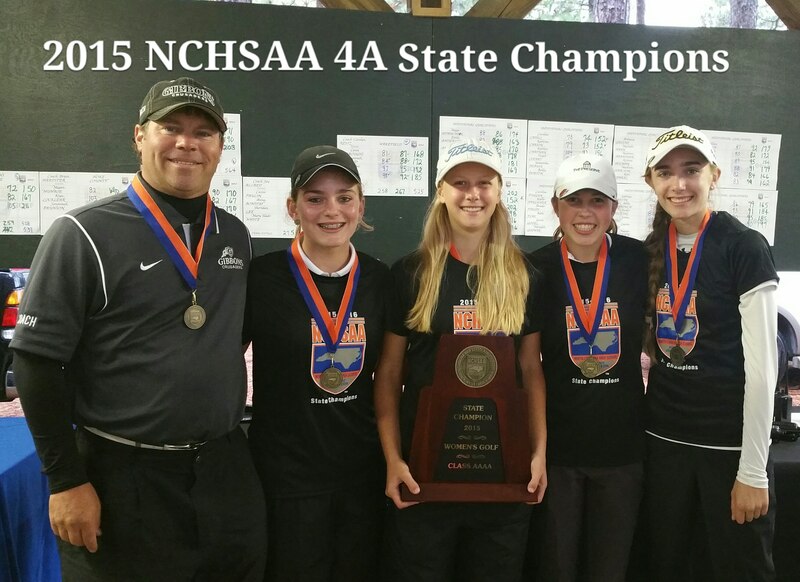 Greg started coaching the Cardinal Gibbons High School women’s varsity golf team in July of 2013. As he approached his first season as the Head Coach, he was anxious to see the potential the women brought to the team. Each woman was dedicated to practicing, playing and competing each and every week. With their desire and ability to improve, Greg used many of his coaching experiences and sometimes his instructional experiences to expand on their desire to compete at the highest level. He was seeing huge improvements and the lower scores were showing it. By the end of his first season at the State Championship, the team finished in solo 4th Place after two solid days of battling the elements at Foxfire (270 & 266). 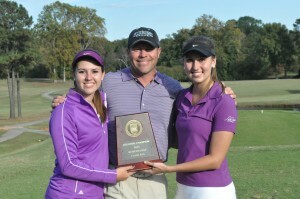 The team was led by two team captains, Caroline O’Neil & Ellen Smith. Caroline placed in the top 5 in all seven conference matches and was Medalist (1st Place) in two events during the regular season. With a 9-hole scoring average of 38.8 and an 18-hole score of 77, she finished in 2nd place and led the team to a 1st place conference championship. Both team captains were named All Conference for their great play. As fast as the 2013 golf season ended, Coach Greg was on auto pilot preparing for 2014. The schedule was coming together, and all of a sudden it was time for tryouts. Initially, he anticipated seventeen women trying out this fall. However, as the first day of tryouts arrived, only eleven women were ready to compete, and that included four freshman with tournament experience. The first day of tryouts proved that the competition was going to be fierce. Hailey Freedman jumped out of the gate during tryouts firing a 33-35=68. 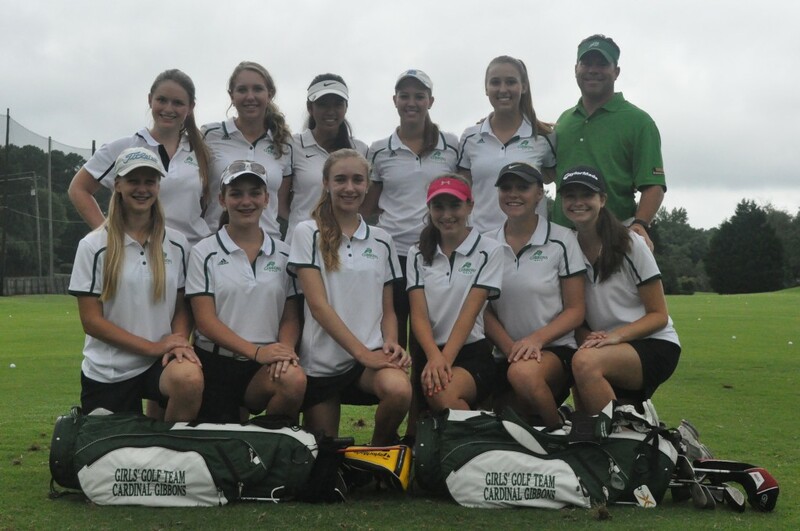 The 1st event was hosted by Cardinal Gibbons at Wildwood Green Golf Club on August 27, 2014. They started the season with a 35, 39 & 40 for a 1st place team score of 114. The team was overly excited! After an undefeated conference season, the team went on to win the 18 hole Conference Tournament, Regionals and it’s 1st ever 3A State Championship. Here’s a recap of the teams accomplishments! The golf course at this tournament plays longer than the regular season conference matches. After the team brought home the State Championship trophy, we realized that history had been made. 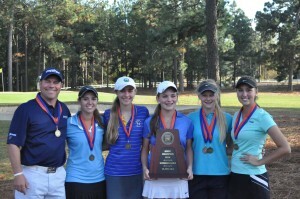 The women’s golf team helped Cardinal Gibbons clinch 1 of 6 State Championship titles for the school. It was a perfect season with a perfect ending. The two team captains, Caroline O’Neil & Ellen Smith, will graduate knowing they fulfilled their goals and accomplishments! 2015 was going to be a year to try and repeat what they started in 2014. After having two marquee players graduate, we picked up a few incoming freshman. 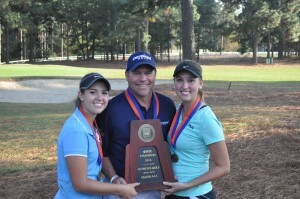 Megan Kanaby came to Gibbons with tournament experience and showed signs of fitting right in. We started out where we left off last season, by winning our 1st conference match and then continued to win the next 5 conference matches… going undefeated. The team had so much momentum, that things were on an all time high. We worked into the conference championship match at Chapel Hill Country Club and came out on top with another win. Amazingly, we were firing on all cylinders and not ready to show any signs of weakness. The word was “look out for Gibbons!” As we prepared for Regionals at the Heritage Golf Club in Wakeforest, our scores only kept improving. Hailey Freedman led the team to victory by shooting 71 and finishing 2nd place individually. Riley Smyth finished 4th individually by shooting 74. Hannah Rose Bruxvoort & Megan Kanaby both finished in a tie for 10th place and shooting 80. 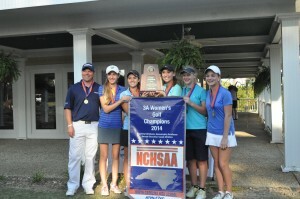 All four qualified for the 4A State Championship at Pinehurst #6.